Last week hate and fear triumphed over our constitutional First Amendment. House Republicans, once again in timid positions, hide under their desks afraid of Democrats, again accusing them of racism; this time because they meekly tried to clarify and provide guidelines on the use and sale of Confederate flags in national parks and cemeteries. The U. S. House of Representatives had approved “without opposition” Democrat amendments to a Department of Interior appropriations bill to prohibit federal funds for the purchase or display of the flag on U. S. Park Service lands and to prohibit the use of it on graves of Confederate soldiers, according to a USA Today article by Susan Davis. 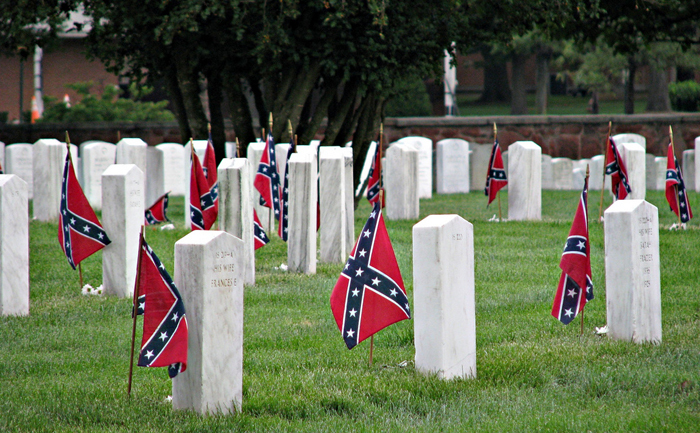 In 2010 Interior department guidelines permitted “small Confederate flags” to be placed on the graves of Confederate soldiers to honor them on Confederate Memorial Day—observed by ten Southern states for family descendents to honor their ancestors—but flags had to be removed soon after the Memorial Day. Even that token respect for Confederate soldiers’ sacrifices and bravery was not acceptable to the spiteful Democrats. Rep. Dan Kildee, D-Mich. took the floor to declare: “House Republicans want to keep the Confederate flag—and all that it stands for—flying high.” House Speaker John Boehner, R-Ohio fecklessly pulled the bill. He didn’t want this to become a “political football.” Apparently, Boehner hadn’t noticed that the “football” had already been deflated by faint-hearted Republicans, including the governor, in South Carolina. Some State legislators there had courageously opposed the removal of the flag. They offered a compromise that may have been acceptable until an unstable female Republican “shaking with emotion” and with “angry tears” cowed the State House members into voting to remove the flying flag to obscurity in a nearby museum. Policinsky cites the 1798 Sedition Act that stifled criticism of Congress and the president based on fears of war with France; and Lincoln ordering his military to close 200 news offices and jailing newspaper editors critical of his war plans, for his fear of losing the war. We will never again be the free people we had hoped to be if we allow ignorant, fearful and hateful people to purge our history and control our culture. Mr. Smith writes essays and commentary on politics, American history, environment, higher education and culture. He's been published in print media and at blog sites for about 20 years. Smith's formal education includes B.S. and M.S. degrees from the State University of New York and Syracuse University. He has earned a 21-credit hour Certificate in Professional Writing from the University of North Carolina-Wilmington. Training/work experience: NYS Ranger School; U. S. Army, Corp of Engineers; soil scientist and forester with USDA; Assoc. Professor at SUNY; real estate agent; small business owner. More from R.E. Smith, Jr.